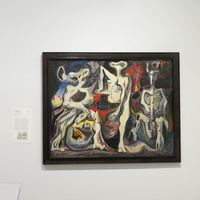 Nearly 90 Surrealist masterworks of the 1930s and 1940s by artists such as Salvador Dalí, Pablo Picasso, Max Ernst, and André Masson are presented through a timely lens—that of war, violence, and exile. Despite the political and personal turmoil brought on by the Spanish Civil War and World War II, avant-garde artists in Europe and those who sought refuge in the United States pushed themselves to create some of the most potent and striking images of the Surrealist movement. Monstrosities in the real world bred monsters in paintings and sculpture, on film, and in the pages of journals and artists’ books, resulting in a period of extraordinary creativity. To hear the exhibition’s free audio guide featuring the exhibition curator and other experts, please bring your fully-charged smartphone and earbuds or headphones with you on the day of your visit. The BMA also has a limited number of iPods available for guests to borrow.